That smooth fabric found within the interior of your suit jacket is called lining. It serves several practical purposes—and if you go custom—provides an extra way to style your suit. The purpose of a suit's lining is two-fold. It ensures that a suit jacket won’t catch against the shirt being worn underneath it (particularly if the jacket is made of wool), and allows the jacket to be slipped on and off with ease. It also helps the jacket to keep out the cold, a feature that should be welcome in the cooler months. However, those are just the practical purposes. When it comes to selecting your lining, you may have dozens of colors and even patterns to choose from. Depending on your preference, linings can blend into your suit, highlight your suit’s existing colors and patterns or stand out boldly on their own. A custom suit lining doesn’t have to be flashy. You can keep it simple by selecting a color that either matches your suit or falls on a different tone in its color scale. For instance, consider a classic navy suit with a light blue lining. 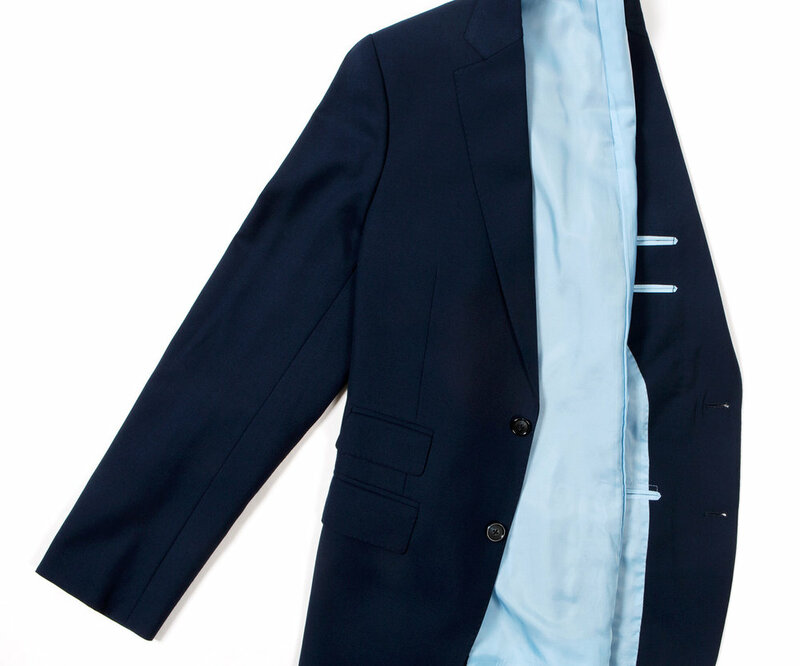 The light blue lining stands on its own but is close enough to blend into the rest of the jacket. A bolder step is to choose a lining that matches with one of the colors in a patterned jacket. For instance, consider a grey glen plaid jacket with a light pink check. A pink lining will pop, but will also draw attention back to the pink in the jacket’s pattern. Darker colors—such as a navy glen plaid jacket with a purple check and purple lining—will be a bit more subtle. To show off your linings loud and proud, simply select a color that isn’t related to your suit jacket. 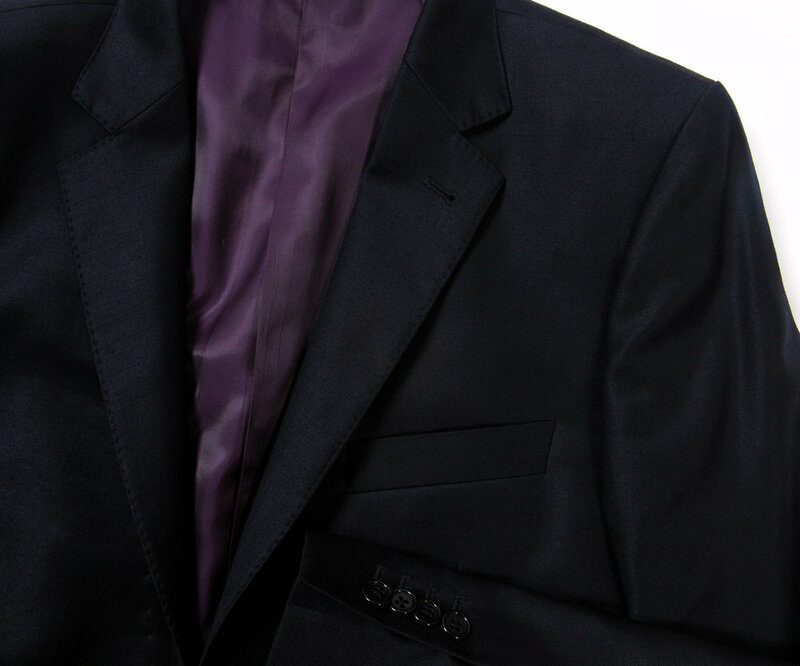 For instance, dark purple linings with a navy suit jacket. This will draw attention to your jacket’s lining whenever it becomes visible, and that’s precisely the point. Unsurprisingly, patterned linings fall on the “bold” side of the spectrum. But just how bold is still up to you. A pattern with colors unrelated to a suit jacket—say, grey with black microdots against a mid-navy jacket—will pop more than a pattern that’s tonal, like a blue paisley lining against dark navy.